Thank you all who serve for this great nation and our allies. Your selfless sacrifice and patriotism does not go unnoticed. Official Military Art, military art on this site and artist Todd Krasovetz understands and respects what you do. Your commitment, dedication and continued loyalty is important. This website is dedicated to you. 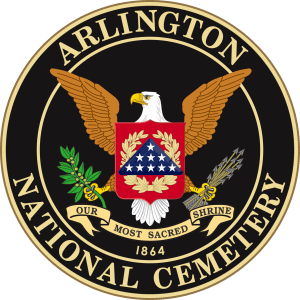 The artists work here is intended to celebrate all branches of service, current active duty service men and women, past, present and future generations. Renown artist, Todd Krasovetz work has been commissioned by Disney, (ABC,& Lifetime Army Wives), US Army, Navy, USAF, Marine Corps, NYIT, Rady’s Children’s Hospital of San Diego, USAWOA, and many others. It is important to note, that the overall theme behind these spectacular works of art, is the spiritual undertone that is depicted in his paintings. 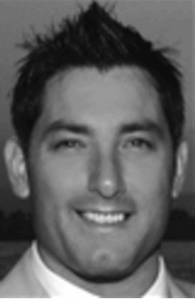 Todd’s work proudly hangs at various Marine Corps, Air Force, Army, Navy Bases. His work can also be seen in several veteran hospitals throughout the US. The authenticity of the artwork is a key factor that has allowed Todd Krasovetz to facilitate collections for individuals, as well as college and corporate clients. His reputation as an artist is based on integrity and professionalism and the historical accuracy behind the art created. BREAKING NEWS! 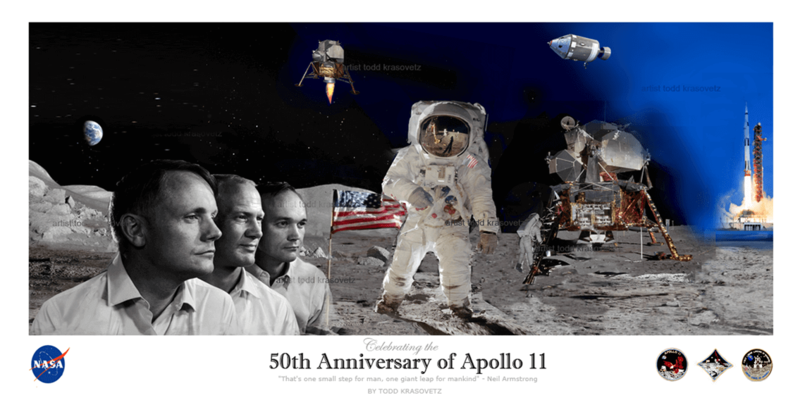 Artist Todd Krasovetz Commissioned to Paint NASA’s 50th Anniversary of Apollo 11 Lunar Moon Landing. PRE-ORDER NOW!! Why NASA’s 50th Anniversary Piece of Apollo 11? Since the dawn of man was able to utilize tools and evolve over the centuries, the ever-recurring goal was to explore, to expand the horizons or push the limits for both survival and sacrifice. Starting with the voyage that brought explorers to the “New World”, the goal was to push the limits out into the unknown, into treacherous waters with the hope of settling into new territories, to create a new beginning. These great explorers looked to the sea in awe, with intrigue and a drive to expand and explore many centuries ago. Now our latest generations have shifted this paradigm to the skies, to space and beyond. Again to explore the unknown, push the limits, to create a new beginning for a new generation, which has and will provide a glimpse of hope to settle into new territories, beyond this planet. The fine men and women, our explorers, are known as Astronauts. For many astronauts, the drive and determinations to become a part of the elite explorers started as a part of their childhood. The popularity of the astronauts exploded in the late 1950 and 1960’s with one triumphant feat that not only accomplished “one small step for man” but also changed the worlds view on space travel forever. These 3 men, along with an entire nation accomplished something that was thought the impossible, pushed the limits against all the odds to beat the then USSR to the moon, causing a domino effect that eventually entitled our nation as “space supremacy”. Original Military Art Oil Painting by Todd Krasovetz. 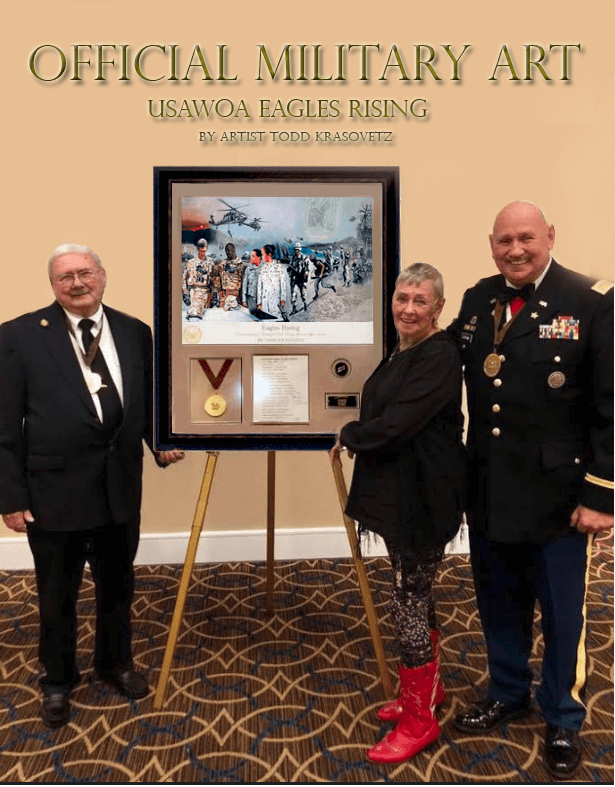 As a result of this successes, we want to afford you the opportunity to purchase a print of USAWOA latest painting titled, “Eagles Rising,” Click HERE to pre-order your limited edition print. Select drop-down below for frame ordering.Order Now! 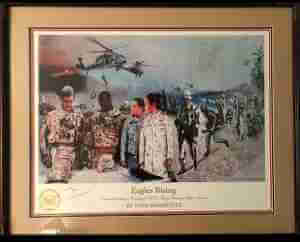 “Eagles Rising” presented to the Vice Chief of Staff of The Army. USAWOA: “Eagles Rising” Preservation Framing Examples. *Double Matte, Gallery Framing : 2 coins with Custom Name Plate.Door to Door $1,049.00 USD (print not included). Order Now! Triple Matte, Custom Gallery Framing. Addition of 2-7 coins with 8 x 10 letter or stationary 3 matte’s $1,475.00 USD. Order Now! Double Matte, Custom Gallery Framing. One Coin . 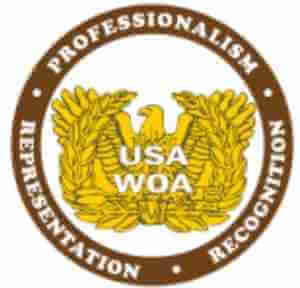 USAWOA Crest. Door to Door $899.00. Order NOW! 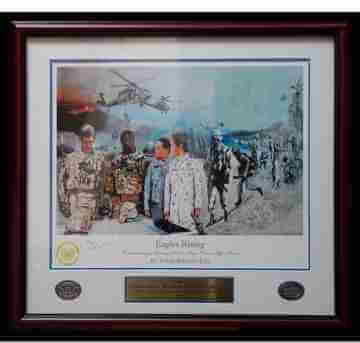 Here you can shop and buy some of the finest works of art for the military painting & prints available. From limited edition prints, posters, & original fine art. 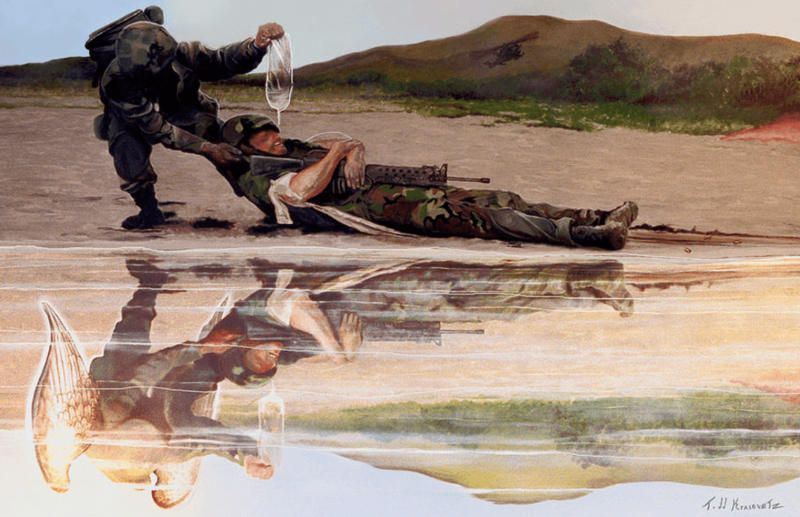 As a result, people often ask, “what is it about military artist Todd Krasovetz is so special”? The answer is simply, the quality of the artwork. The overall theme behind the majority these spectacular works of art, sometimes has a spiritual undertone. Todd’s work proudly hangs in various Marine Corps, Air Force, Army, Navy Bases and government installations around the world. 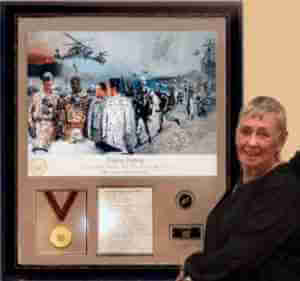 Military hospitals like Walter Reed National Army Medical Center and the Naval Hospital Camp Pendleton, CA, also have his work on permanent display. 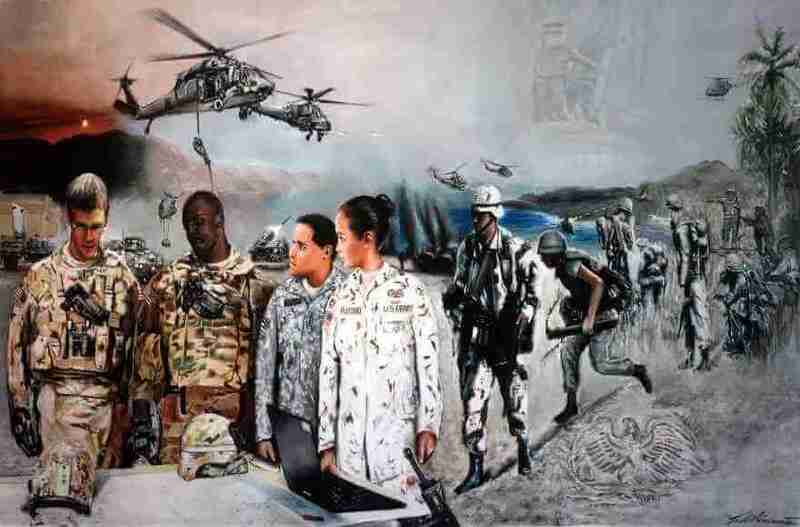 What is the Importance Military Art & Artists? The battle scene is one of the oldest types of art in developed civilizations. The suffering of casualties and civilians is a element that has taken much longer to develop. Depictions of anonymous soldiers away from the battlefield have been very common; since the introduction of military uniforms such works often concentrate on showing the variety of these. Naval scenes are very common, and battle scenes and “ship portraits” are mostly considered as a branch of marine art; the development of other large types of military equipment such as warplanes and tanks has led to new types of work portraying these, either in action or at rest. In 20th century wars official war artists were retained to depict the military in action. It is important to note, the military artists of today are closer to the action of the battle scene now more than ever before. As s result, these action causes society to increase the need for graphic media and it’s dominant in main steam media networks. This includes, the suffering of casualties and civilians as it has taken much longer to develop. It is important to note, this applies to portraits of military figures as well. Furthermore, this due to the introduction of military uniforms, such works often concentrate on showing the variety of these. 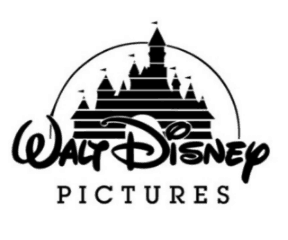 “Recently, Walt Disney Pictures Commissioned artist Todd Krasovetz to produce art for the set of a popular TV show. See “Wings of Hope” on the set and click Live News Article Angel Waiting by Todd Krasovetz. Oil on Canvas 35 x 48 inches. Limited Edition Prints Available. Our mission is to offer museum quality fine art to government, public and private entities worldwide. 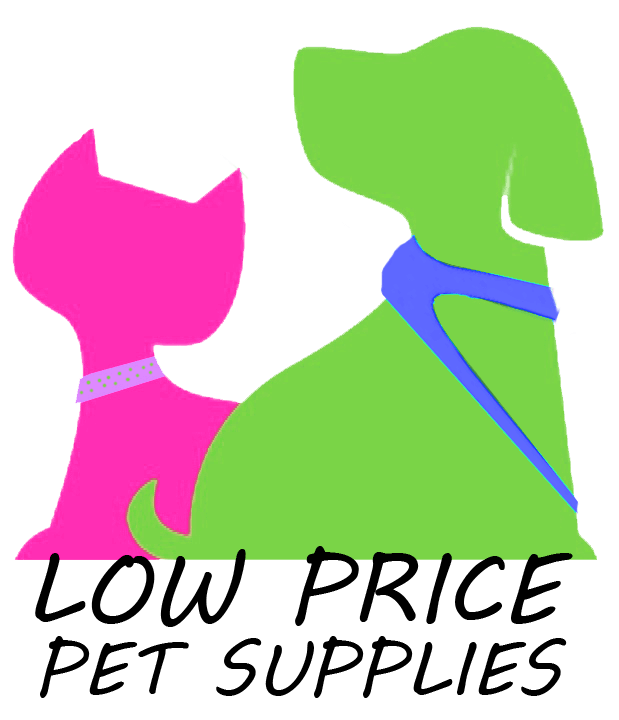 Fell free to like & share from the social media links below. Please feel free to contact the artist direct about having your original art commissioned. For all Military and Govt interests, please note that it highly suggested that you have budgeted 5-10 k minimum for a 36 x48 inch (approximate dimensions) prior to commissioning artist Todd Krasovetz. Call 1.619.490.9985 or email wingsofhope@gmail.com.